Services are scheduled for 10 a.m. Saturday, June 2, at Our Lady of Grace Catholic Church for Refugia Dominguez DeHoyos of Artesia. DeHoyos, 88, passed away Thursday, May 31, 2018, at her home. Fr. Vijay will officiate the services, with interment to follow at Twin Oaks Memorial Park. Pallbearers will be Johnny Florez Jr., Chad Harcrow, Scott DeHoyos, Anthony Salsberry, Frank DeHoyos, Michael DeHoyos, Jason Lathrop and Chris Doporto. A rosary will be recited at 9:30 a.m. Saturday at Our Lady of Grace. 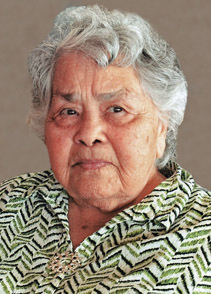 Refugia was born July 4, 1929, in Pecos, Texas, the daughter of Juan and Julia (Reza) Dominguez. On May 1, 1950, she married Ricardo DeHoyos in Artesia. She was a housewife and member of Our Lady of Grace Catholic Church. Refugia enjoyed singing and spending time with her family. Survivors include daughters Lilly Florez and husband Johnny, Rita Winters and husband Tim, Lupe Doporto and husband Ronnie, and Delma Salsberry and husband Roy, all of Artesia, Lucy Gallegos and husband Ernie of Rio Rancho, Ramona Haskins and husband Mike of Oklahoma, and Diana Lathrop and husband Bob of Odessa, Texas; sons Ricardo DeHoyos Jr., Tommy DeHoyos and wife Anita, David DeHoyos and wife Teri, Rudy DeHoyos and wife Pam, and Albert DeHoyos and wife Yolanda, all of Artesia, and Danny DeHoyos and wife Lisa of Colorado; sisters Margaret Lopez of Las Vegas, Nev., and Irene Huertaz of Texas; brothers Jose Dominguez of Roswell and Benny Dominguez of Albuquerque; 28 grandchildren; and 54 great-grandchildren. She was preceded in death by her husband, Ricardo DeHoyos, on Jan. 16, 1988. Arrangements are under the direction of Terpening & Son Mortuary. Condolences ma be expressed online at www.artesiafunerals.com.